superdumb supervillain: Mabel's Labels ♥ Bloggers! Mabel's Labels is a mom-friendly company that produces all manner of products to keep your household and all its inhabitants organized. I've written before about my love of their wondrous Tag Mates that identify your kid's clothing with peel and stick ease. But did you know they also make stationery products? 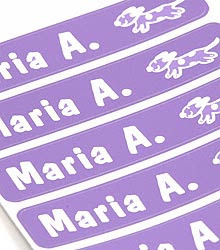 The return address labels are a no-brainer, of course, being similarly sticky-backed and personalized with your choice of icon, much like the signature Mabel's Labels' classic Sticky Labels and Skinny-Minis (my personal favorites). But the Write On! Stationery Kit is a terrific way to encourage your budding letter writer to get those thank yous posted and keep in touch with summer camp friends. 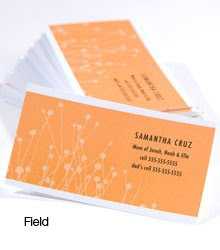 And their new Mama Cards… well, those are for you to keep in touch with friends and associates. Mama Cards would be particularly useful as Mama Blogger Cards at one of the upcoming conferences, like BlogHer '09. In fact, Mabel's Labels is actually hosting a BlogHer Contest, in which one lucky blogger will be sent to Chicago as Mabel's Labels' chief correspondent with all expenses paid. See? Mabel's Labels does truly love you! And, hopefully, me!!! 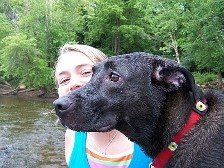 I have been blogging for about two years now and haven't made it to any of the conferences yet. This is my year, I can feel it! Now that Jasper is weaned and Roo is getting more independent, I think that BlogHer would be a fantastic opportunity to meet many of the fabulous women I have gotten to know via the blogosphere and impress them with my vast arsenal of talents, which include impeccable table manners and low alcohol tolerance. It's been really great having a virtual support system and being able to learn from other parents who have been through the same stuff, especially since it's been rough making and holding onto friends here in Wichita, where we tend to stick out like sore thumbs. It's great sharing obsessions with which host of Blues Clues is cuter and what kids gear is truly worthy of purchase… (like Mabel's Labels, for example!) You know, the important stuff about being a mom. It's also been a blast getting to know the business people who make things for kids and families and being able to try new products out on a regular basis. Best of all is the opportunity to pass cool stuff on to my readers via frequent giveaways. I was the promotions director at my college radio station and loved being able to give away records and promo items but it is even more fun to be able to give baby and kid things away, especially to new and expectant parents. To enter and win your own set of Mama Cards (or Blogger Cards, if you prefer! ), please comment on this post with which style you would choose and how you plan to use them. Entries will be accepted through February 18th and I'll pick the winner using Random.org. US readers are eligible. Only one entry/comment per person, please. I hope you get to go to the conference! I'm not quite ready for that sort of thing yet, but maybe someday! I love these cards! I would choose the Field design! I also like the field design. I need to replenish my supply of mommy cards. They are very handy! I was just looking for some cards like this. I love the brocade. I like the Summer Day one's. I think Momma Cards would be very useful. Thanks! I like artsy momma. I would use them for cards to win lunch giveaways-what a good idea! Hope you can go! Crossing my fingers for ya. Google Reader subscriber as well. I love the field design! 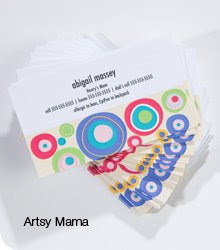 I like the artsy mama cards--goes well with my blog title, Hormone-colored Days, don'tcha think? Good luck! Hope to see you at BlogHer! i like the summer day design. Anyway, I love the Brocade design, and would probably do a combo Mama/Blogger card if I can. I'd use these for playdates and getting the word out about my blog. These are cool! Go Mabel! I'd use my blogger cards for reading everyday! I like the Artsy Mama mama cards and would use them to introduce myself to neighbors and fellow volunteers in the groups I work for. I would get the Posey cards and pass them out to people I meet who want to get in touch. A lot of people want to talk to me since I'm a R.N. ; have identical twin boys; and an autistic stepdaughter. 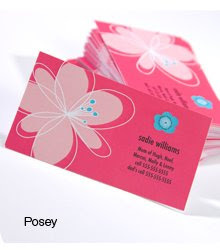 I would use the POSEY cards for BlogHer this year. I ordered 100 cards last year and ran out by the first night! I would choose the Brocade labels and give them to moms I meet at my daughter's preschool and MOPS. I love the Artsy Mama cards! I'd use them to get the word out about my blog! I like Summer's Day design, and I would give them to friends and new people I meet. I like the Artsy Mama cards. 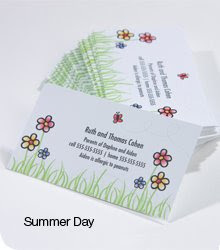 I like the Summer Days cards best! I still haven't made it to any of the conferences, either. Sigh! One day I hope! I like the Artsy Mama style. I would choose the Summer Day ones, because I like the design on them. I would hand them out to other Mommy's I know so they would have my contact info in a neat package. Love the field pattern, and I'd write very belated thankyous on 'em! 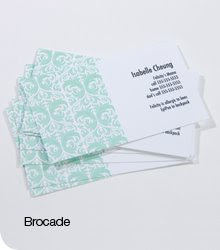 I would choose blogger cards in "Brocade" style. I would hand them out to people if we start a conversation that leads to my blog! I would love to win a set of the Mama Cards in field. My son started Kindergarten this year and I have such a hard time exchanging information with other parents for play dates, PTO, etc. These would be so handy! I like the Summer Days. I would use the Mommy Cards to connect with other moms. These would be so useful when I'm out with my 2-year-old and 8-week old daughters so that I wouldn't have to dig around for a pen and paper - not to mention that I don't usually have a free hand anyway! My favorite is the Posey design. I would pick the posey mama cards. They would be great for passing out at preschool functions, or we have classes we go to at ballet and the library. It would be nice to connect with other parents and their kids outside of these classes. Thanks! I love the artsy mama cards. I would choose the Summer Day design. I would use the cards for entering "drop off a business card" contests. I would like blogger cards to hand out to businesses.